An old student of mine that is now in college posted on Facebook that she had a big exam to study for. I gave her my favorite study advice. Eat Orange Tic Tacs. The trick is to eat the Tic Tacs while you study your notes and text book. 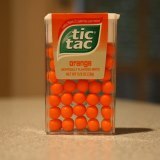 It does not necessarily have to be Orange Tic Tacs; it just has to be a candy or breath mint that you rarely eat. It also must have a strong scent. Then, don't eat that candy any other time. Finally, eat the candy while you take your exam. You will be shocked how well you remember the content and how well you do on the test. Don't believe me? Think about this...What is your favorite smell? Take a moment and think about it. Now answer this - why is it your favorite smell? I have asked my students this question a few times, and none of them say that their favorite smell is the best because it is sweet or makes their nose feel good. They all tell stories of a happy time that is associated with the smell. The smell of the ocean that reminds the of a trip to the beach with their friends. The smell of their grandmother's chocolate cake that she makes on everyone's birthday. The smell of chalk that the student uses at gymnastic meets. Smells are linked more directly with memory than any other sense. How many times have you caught a faint whiff of a scent that reminds you of a person or place that you have not thought of for years? It's almost like your nose remembers better than you do. Why not harness that olfactory-mnemonic power to help you on a test? The trick is give your nose a smell during the test that will remind you of the good ol' days when you had your notes and textbook in front of you. It will increase your recall and make your test easier. I haven't heard how my old student did on her ram, but I bet she's happy with the results. Of course, Tic Tacs won't help you if you have an essay instead of an exam. That's what our Essay Engine is for, it will make essay writing a breeze. Stay tuned for my next post on the Teachademics blog where I share with all of the teachers why the Tic Tac trick really works.